Do I Make Money With My Blog? I get this question a LOT. And the answer is always the same, a resounding and honest… NOPE, I don’t make money with my blog. I didn’t start this blog with the intention of making any money, and until lately I never even thought about it. If you want to know why I started this blog, you can read all about it on the about me page. I also blog because I love to write and this is a major creative outlet for me. I like playing with graphics, playing with word press themes and meeting new people online and blogging affords me all of those luxuries. But blogging doesn’t pay my light bill. If you blog – begin by working your blog more seriously and looking for specific job openings that are related to your blog content. If you donâ€™t blog – determine a topic that interests you, sign up for a free blog account and start learning your way around. I talked about blogging because it’s a great way to get your feet wet online and acquire a new skill. And because you never know what connections and activities will ultimately lead you to finding that perfect opportunity you’ve been looking for. What I didn’t mean to insinuate is that you can start up a blog today and then just quit your day job tomorrow because blogging is such an easy way to make money. It’s not. It’s hard work. Even if you manage to start a blog and keep it updated often with fresh ideas and handy information, there’s still the matter of figuring out just how you’re going to make money with it. So now that I’ve answered that question officially and settled that score, let me also tell you that it wouldn’t exactly hurt my feelings if this blog could pay my light bill or treat me to a manicure. Over the past few months I’ve added a few things and explored some ideas in an attempt to help make my blog at least pay for itself. It is, after all, a time consuming endeavor that actually costs me money every month. I suppose for some folks, who have the major time to devote, blogging can be a way to make that extra income, to pay the lightbill or to live the extravagant life of the rich and famous. But I’ll guarantee it’s not the norm and you should consider yourself quite a success if you can pay all of your bills and afford to quit your day job all by running a blog (or two or three or seven). That’s called pro blogging, and if you want to become a pro blogger you have a hard row to hoe. So here’s one tip from me and some resources that might help get you moving in the right direction if you think you’ve got what it takes to write for a living (and you’re not afraid of hard work and rolling the dice for a few years to see if you can make it work). If you’re going to start blogging, pick a topic that you’re passionate about and already know a lot about. Blogging is actually hard work and sometimes tedious work. If you’re going to do it for a living, you’re going to be writing and reading about your topic day and night. Your topic had better be something that you’re more than just interested in. It better be something you’re in love with. There are a lot of sites out there that promise you’ll make a stack of cash just by blogging. Those types of sites make it sound simple. I’m sure those types of sites do make a slew of money — they make money by duping you into believing that by buying into their program you’ll be able to have a better life and drive a Lamborghini, just like they do. That said, let me tell you that there are also some good, solid resources out there for the pro blogger wanna-be. I know because, I’ve been exploring options and looking for ideas that might help me make my own blog self-sufficient. I’ve also joined a few new networks to meet more bloggers and have some fun. The title of the blog kind of says it all, but this blog is also about ways of getting traffic to your blog (and then how to try to profit from that traffic). This guy’s got lots of experience and his blog covers, in his words, “what it takes to successfully design, market, promote, and monetize” a blog. So if you’re into pro blogging, start with these two for a pretty well-rounded picture of what it might be like and what kinds of things you’ll need to consider. I think you underestimating yourself. It is not difficult to make money with a blog and you definitely do not need to be a pro-blogger to make enough money to cover your living expenses. Look into this, you might be amazed with the simplicity of how money can be made online. I’ve never wanted to put that much time into my “hobby” but after two years of blogging perhaps I should look into ways of getting this blog to at least pay for itself since I’m sure I’ll continue to blog here for a long time to come. You know Lisa, making money should be one option. Why not? If some cash flows in, no problem. My site also is not so monetised (many a times Ty had given me tips to do it); you can say it is my hobby + trying to make some money. Anyway, you have written well. Keep it up! It doesn’t hurt to try to gain a little extra income from your blogging, but I didn’t want to give folks the impression that it’s an easy (or necessarily steady) living either. It actually requires a lot of work (just like running any business does). When I was looking for telecommuting opportunities, I wanted a fairly regular paycheck from a company, not another home-based business idea. I have been blogging for almost two years. Just trying to build an audience takes way too much time, I can’t imagine what it would take to make money. I would obviously have to sell something to someone, and I have never been very great at that. Nice one! I do make money from my blog, but I am blogging way way back year 2005. I love blogging. It became my personal online diary when one day I thought of sharing it to the public. Then later on, I learned that I can earn from blogging. Actually, it doesn’t become hard for me to earn because in the first place, I love writing and posting on my blog. 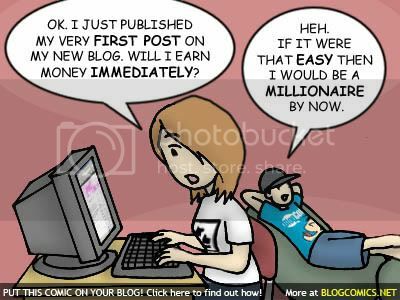 That’s the problem with other people who wants to earn from a blog but doesn’t like to blog. Thank you all for the enlightened peek into your own situations and blogging. I think the “answer” is that if you blog for the sake of blogging (like you breathe for the sake of living) your blog is already a success no matter what the monetary gains (or in my case, costs). But if you blog for the sole purpose of making a dime, it can be far more trouble than it’s worth to build an audience and capitalize on their readership. Perhaps I’ll continue to read about ways that might allow this blog to earn its keep… but I’m afraid it’ll never be the purpose of this blog. I really appreciate the comments here and have been looking at different ways I might generate some form of revenue for the work I put in here. But it’s really a labor of love and I still struggle between that and making it a sustainable venture. But I guess that’s fodder for a future post… Thank you all for the advice. Hey Lisa (my name too) – thanks for stopping by my blog thru entrecard. This is an interesting topic for me because I started blogging as a way to get myself to write regularly and creatively (main blog), and as an outlet for my political frustration (political blog). To my surprise I gained an audience and made many friends. I have been experimenting with payperpost and blogsvertise, but it’s a tough go, and I always feel cheap when I write a paid post. 🙂 So…it’s an interesting ongoing discussion and exploration and it can’t help but keep me informed on current online trends and in the long run make me more marketable if I have to drag myself back to the dreaded corporate job. Gotta do what you’re interested in. I know I am a little late commenting, not to mention reading this article, but I just wanted to let you know that there is some good information here. I make a little from my blog but not enough to cover the bills. Maybe someday.